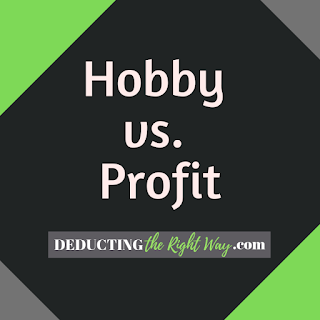 The IRS interpretation of a hobby differs from what you’ve learned in a traditional dictionary, so it’s easy to presume your activity does not fit within the parameters. Let’s look at the explanations before jumping to conclusions. It's when you sell a product or service with no plans to make it a lucrative enterprise (or waiting to see how the activity pans out before converting to a full-fledged business). Do you have a day job or other livelihood? Then, you're probably a hobby. Hobby examples: selling a home-made craft at the local farmer's market during your free time, photographing landscapes when you're not at your full-time job (and selling them online), or occasionally teaching piano lessons. TIP: The term can also apply to a for-profit venture if it’s not your primary source of income. What is a for-profit business? It's a trade marked by your dependence to turn a profit on your investment of time, money or property. Is this your primary source of income? Then, it's likely a business because you are devoting all your efforts to making it a success. For-profit examples: accounting/law firm, e-commerce store, freelance writing, coffee shop, bakery, dentistry, IT consultant, Uber driver, Airbnb host, and much more. TIP: Creating a company does not by itself mean you are a for-profit business. You must satisfy specific IRS tests based on the facts and circumstances of your situation. What are the tax differences between a hobby activity and a for-profit venture? A hobby can only deduct the cost of goods sold from its revenue, but the upside is that the income is not subject to self-employment tax, so you only pay ordinary income tax. A for-profit business can deduct all expenses to lower its revenue (and even create a loss), but you pay self-employment tax plus ordinary income tax.